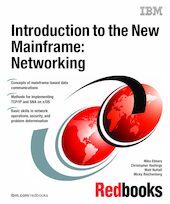 This IBM Redbooks publication is designed for a one-semester course intended to provide information systems students with the background knowledge and skills necessary to begin using the basic communications facilities of a mainframe-based system. It provides a broad understanding of networking principles and the hardware and software components necessary to allow the mainframe to participate in a high volume data communications network. It is part of a planned series of textbooks designed to introduce students to mainframe concepts and help prepare them for a career in large systems computing. While many of the networking concepts covered are operating system-independent, the main emphasis is on the z/OS operating system. You are assumed to have successfully completed introductory courses in computer system concepts, including courses in computer organization and architecture, operating systems, data management and data communications, and systems design and analysis. A basic understanding of z/OS job control, library structure, and system libraries is assumed. It is strongly recommended that you have already completed an introductory course on z/OS, such as one that uses Introduction to the New Mainframe: z/OS Basics or a comparable text. In some instances, the z/OS Basics course and the course associated with this textbook could be taken together.